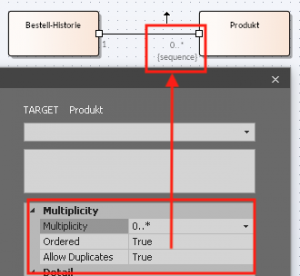 In a so-called 1: N – or more generally N: M – relation modeled by an association between two objects, it is sometimes necessary to specify a little more information – for example, an object instance may not take part in that relationship more than once. 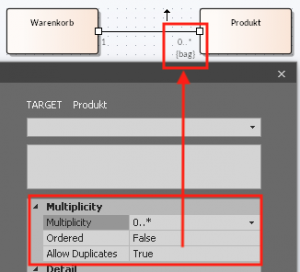 The association properties that can be found and set in the Enterprise Architect in the Properties dialog (up to and including EA-13) or the Properties window (from EA-14) are used for this purpose. It is important to note that setting the association properties only works (and causes a corresponding display in the diagram), even if corresponding multiplicities are set (0..1, 1, 1..1 are ignored)! Indicates that each association end points to a set of ordered object instances (Ordered = true) where each object instance is allowed to join the association only once (Allow Duplicates = false). Indicates that each association end points to a set of unordered object instances (Ordered = false) where an object instance may also join the association several times (Allow Duplicates = true). Indicates that each association end points to a set of ordered object instances (Ordered = true) where an object instance may also join the association several times (Allow Duplicates = true).